As gaming technology has advanced from desktop to mobile, we’ve seen all kinds of interesting innovations along the way, with 3D pokies being one of the most significant advancements. Due to the popularity of 3D casino gaming, it was only a matter of time before virtual reality games became a reality, and the future has finally arrived! We cover the basics about virtual reality slot games and where you can play these state-of-the-art pokies for real money bets. What are virtual reality pokies? Virtual reality pokies provide a whole different dimension to online game play. Using the Oculus Rift VR headset or other wearable devices, users can walk the aisles of a virtual pokies lounge to sit down to play a game or interact with other players in a way never been done before. With the use of the goggles, you’ll be able to watch the reels spin in pure three dimension, for a completely immersive gaming experience which is the closest thing you’ll get to playing in a land based casino. Just like playing at a standard online casino, virtual pokies can be played for real money bets with plenty of safe deposit options available. Slots Million launched the first ever virtual reality pokies lounge in October 2015 and remains the only trusted online casino to offer this advanced technology. Their virtual pokies lounge contains some of the most popular online pokies titles, which can be accessed by downloading the free virtual reality casino. Games can be accessed in VR mode with the use of the Oculus Rift headset, while those who don’t own this fancy device can play in pure 3D mode instead. New players at Slots Million receive double their first deposit up to a value of $100 for free, plus receive 100 free spins to use on some of Net Entertaiment’s most popular pokies. Sign up via our links to claim this exclusive welcome package and head to the ‘virtual reality’ page at the top of the main game lobby to download the VR software. Once you’ve registered for an account with Slots Million and downloaded the virtual reality software, playing for free or real money is easy. All deposits and withdrawals are made via the standard Slots Million desktop site, with the virtual reality and 3D casino reserved purely for game play and player interaction. Open the game application from your desktop and use your username and password to sign in, or if playing for free you can just log in as a guest. 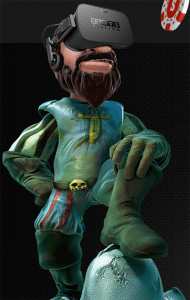 Select your favourite avatar – this is the animated character other players will see when you’re walking through the virtual pokies lounge. Chat with other players by approaching other avatars in the lobby, but rest assured they will never be able to see your game screen. Walk the aisles and sit down in front of the pokies machine you wish to play. Game play unfolds as per usual. 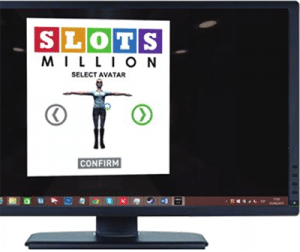 There is a detailed user guide available to download from the Slots Million website which provides further information regarding what buttons to use to play games. What virtual pokies games are available? All of these games can be played in both VR and 3D mode. For more information about the slot machine innovations that lay ahead, we speculate about the next generation of pokie games. Sign up for an account with Slots Million to play virtual reality and 3D pokies and claim a matched deposit welcome bonus up to $100 when depositing real money for the first time.